The Southern Baptist Convention is fully “woke.” Each and every entity of the SBC is pumping out Critical Race Theory as aggressively and quickly as they can. Lifeway Christian Resources, the publishing and retail arm of the SBC is keeping pace with Southeastern Baptist Theological Seminary’s “Kingdom Diversity” Affirmative Action initiative and the Ethics and Religious Liberty Commission’s hard at an unapologetic promotion of Cultural Marxism. 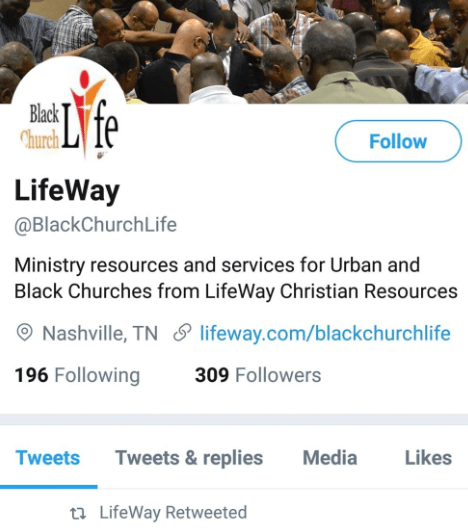 Lifeway now has launched a ministry devoted entirely to one specific ethnicity and to the exclusion of other ethnicities. Back in the day we all agreed that was racist. Martin Luther King may not have been a Christian (he denied the resurrection and the deity of Christ, just for starters), but he would have strongly rejected Lifeway’s approach to relevancy and pragmatism. In fact, Dr. King would have considered the notion of exclusivity-by-race to be a gross perversion. We should, as King asserted, judge people by the content of their character and not the color of their skin. Critical Race Theory, on the other hand, insists on fixating upon race and ethnicity and finding identity solely in demographic minority status. These Cultural Marxists go so far as to claim that “color-blindness” – perhaps the central tenet of Dr. King’s ideology – is inherently racist (the ERLC has made this claim repeatedly). Apparently, there aren’t black people in rural America. Who knew? Of course, there are not unique ministry needs in “urban and multicultural” communities. People are sinners who need saving. That never changes, and neither does the Gospel. They also just finished hosting a “Black Church Leadership and Family Conference” today. Pulpit & Pen has reached out to Lifeway and asked if they have a “White Church Leadership and Family Conference” planned. They have not responded by the time of publication. In the meantime, the current consensus of the Evangelical Intelligentsia seems to be, “We can’t be racist; we intentionally divide people by ethnicity.” Southern Baptists in the segregated Jim Crow South would have been so proud.